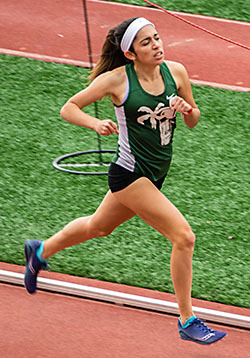 Teresa first broke the 1600 record on April 27th 2018 at the Escondido Invite with a time of 5:03.67. Then, at the CIF prelims she lowered it to 5:03.22. Like her predecesor, Katherine Wingert, Teresa was a three-event champion at the League Finals with wins in the 800, 1600, and 3200 meter runs. For this and for a great all-around season she was named the 2018 City League Female Athlete of the Year. She also holds school records in the 800 and the 2-mile run. She anchored the School Record Distance Medley Relay Team and set the Course Record for the City Conference Cross Country Course at the Western League Finals in 2017. At the CIF Track championships in 2018 she ran the three events, all with great times, to help Coronado win it's first ever San Diego Section Championship. There were two other good marks in the 1600 this season., Madden Hundley ran 5:07.10 which is the fourth best-ever time for us. Her sister, Abigail, ran 5:12.91, which is an excellent time for a freshman girl. From her freshman year to her senior year Katherine always gave her races everything she had, often running four events for team points. For all four years she was the Harbor League champion in the 800, 1600, and 3200 meter runs. Now that more 1500 meter runs are being contested at the high school level we took a split for that distance during her record 1600 meter race to establish a 1500 meter school record. 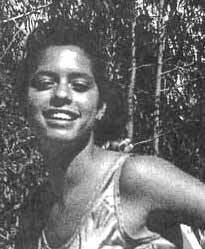 In addition to her 1500 and 1600 records she ran the anchor leg on the record 4x400 relay team. 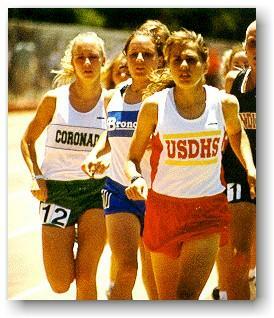 From the 10th grade on Jessica Lunt was one of the top 800 and 1600 meter contenders in San Diego. She was also one of the hardest workers and most coachable athletes I've had the pleasure to work with. I can still hear some of her teammates complaining that all Jessica had to do is show up, that she didn't have to train. What they didn't see was the hundreds of miles she put in during the summer and winter breaks. I know because I ran them with her. 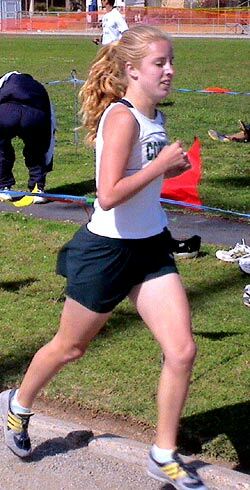 For most of the time when she was at CHS, track preseason training consisted of Jessica and her coach running around Coronado. It obviously paid off for her as she had a great running career at UCSB and still runs today.